Learn how to replace the string on your yoyo. 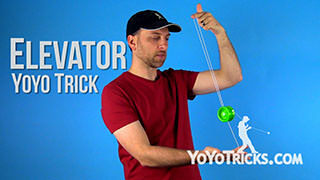 Put on and Adjust Yoyo String Yoyo TrickIn this video I am going to teach you how to put a string onto a yoyo, and get it set up for learning tricks. Now specifically, I am going to show you four things. I am going to show you how to attach the string to the yoyo, then I am going to show you how to adjust the string for your height, which will make learning tricks easier. Once you adjust the string, you are going to have to retie the knot at the top of the string so I am going to show you how to do that. And finally, I am going to show you the best way to put it on your finger. All this will come in handy when you get a new yoyo and you need to attach the string, or when you have been practicing for a while, and you string starts to wear out, and it might even break. So I am going to teach you how to replace your strings and get your yoyo up and running again right now. 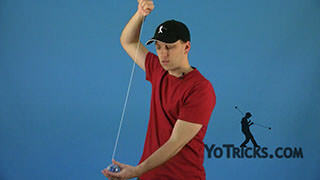 A yoyo string has two sides. There is the side with the knot, and later in the video I am going to show you how to turn this into a slipknot so that it will attach firmly to your finger. Then there is the side that you put onto the yoyo. When you first look at this, you may be wondering how in the world do I get it on there. 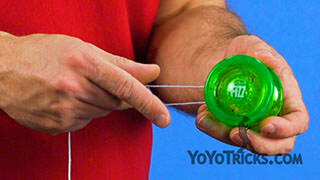 You might even think that you need to tie a knot with the string onto the yoyo to get it to work. 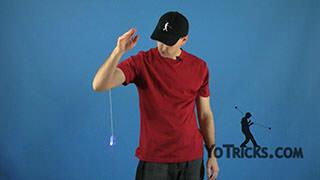 But you definitely do not want to do that because that is a surefire way to keep your yoyo from working. So let me show you what to do. The first thing you want to do is pinch the string at the end and then pinch the string about an inch or two below that. Then, untwist the string and what you will see is that the strands in the string are going to separate. As soon as you can see two separate strands, you can actually grab those strands and pull the string apart. What I like to do is insert my thumb and middle finger and that way I can spread it apart as far as possible so that I can actually get it onto the yoyo. Now, one thing that you want to keep in mind is you always want to put the yoyo string onto the yoyo when the yoyo is already put together. There is a tendency when you are new, to take the yoyo apart and get it on there because you do not have to open up the loop quite as big. But you do not want to do that because there is a really good chance that the string will actually slip off of the bearing and get caught in between the two halves as you screw it together. That is a surefire way to quickly break your string. So just get into the habit of always having the yoyo together first when you put the string on. 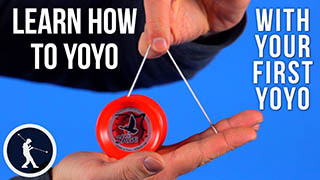 One problem you may encounter when you are first learning to put a string onto a yoyo is that the strands, they kind of wrap up in a weird way so that the string is not smooth coming off of the yoyo. This is actually a pretty easy problem to solve. All you need to do is pinch the string just above the area where the problem is. Then you are going to untwist just a little bit and pull. That will center the string which will smooth it out and take care of the problem. 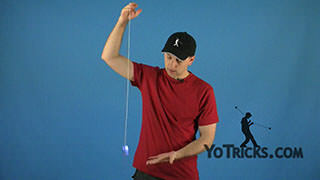 The method I just showed you for attaching the string to the yoyo is called a single loop and that is the method that you want to use for the vast majority of yoyos. Now, pretty much the only exceptions are yoyos that come with this little plastic insert. So let me show you how the string is supposed to go on those. These yoyos are usually Brain style yoyos, also yoyos called transaxles. The string just needs to affix to that plastic piece a little bit differently. So it is going to start off the same way. You are going to open up the loop at the end of the string. You are going to put it on. But instead of just letting the string go, you are actually going to cross the strings and then wrap it around one more time, and even two more times. So this will be considered a triple loop because the string is around it three times. Then that will allow these types of yoyos to work properly. Now if you have a responsive yoyo, with a bearing or wood axle, using a double loop or a triple loop will cause the yoyo to play a little bit differently. If you have a fixed axle yoyo it will keep the yoyo from sleeping so if you have a little brother or little sister and you want your yoyo to play easier for them, you can always double loop it and that will make it easier until they get a little bit better. Then you can go back to a single loop so that the yoyo can sleep again. For yoyos with ball bearings, sometimes a double loop or a triple loop will allow the yoyo to play a little bit more responsive, which again can make some tricks easier, but it should still allow the yoyo to sleep. So it is something that you will want to experiment with and find out what works for you. Once you have the string attached to the yoyo, the next thing you want to do is adjust it for you height. 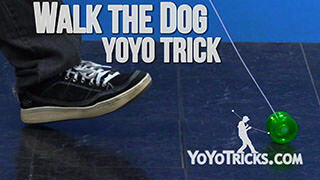 This is especially important for new players because you do not want the yoyo to be constantly hitting the ground as you are practicing because that is really going to throw you off. The ideal height for yoyo string should be that when your arm is parallel to the ground, the yoyo is not touching the floor. In most cases, that will keep you from hitting the floor. Once you get better, you can experiment with longer strings because that will open up a different set of tricks. Or you might want to try shorter strings that your tricks can go faster. But this is just a really really good place to start. So when you want to adjust the string for your height, the first thing that you want to do is you want to get it on the ground right in between your feet. Then you want to find your belly button and put your pinky right where your belly button is right on top of the string. Right where the string comes over your first finger, you are going to pinch the string right there and fold it over. This is going to end up as the top of your new loop. All you are going to do is tie your loop, and then you can get a pair of scissors to cut off the excess. So let me show you how to tie that loop. As we already showed, you are going to fold the string over at your right height so that this is the top of your loop. I am going to make it a little bit bigger so that it is easier to see. All that you are going to do is treat these two strings as if they are one and tie a basic knot. So just take this string, and fold it over on top of it self just like this. Then you are going to take the top of the string, you are going to fold it under this and through this hole right here. When you do that, you can see it looks like that. If you pull it tight, you will see that it makes another loop that is very similar to the loop that was already on the top of the string. So to finish the job, all you need to do, like we showed, is get your scissors and cut this part off. Then you will be good to go. The last thing you are going to do is turn this loop at the top of the string into a slipknot which is adjustable. The reason you want to do this is because then it can fit tightly on your finger and it will not come off in the middle of practice. So this is actually pretty simple. All that you are going to do is take this string coming down from the knot, and you are going to feed it through the loop, at the top of the string. When you do that, if you pull the string apart, you can see that now you have a loop that is adjustable. So the last step is you are going to insert your middle finger, right into the middle of that loop. Tighten it down right in between your first and second knuckle. You want to put the string there because that gives you the largest range of motion, which will help you learn tricks easier. Now that you have got the string onto the yoyo, you have adjusted it for your height, and you have got it on your finger, you are ready to start learning tricks.